Gray wave after gray wave surges out of the bush in small herds of twenty or less, first one group, now another, flooding the huge hollow that contains a waterhole. Dust rises in the air, a potent blend of manure, dried grass and sand. The backwash swells in our direction. 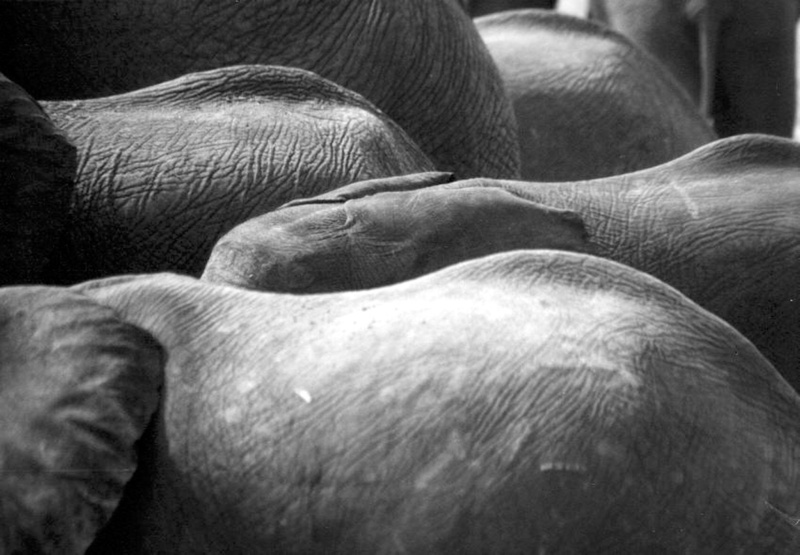 Soon a sea of elephants surrounds us. We’re submerged in a roiling world of noise. Snorts, grumbles, trumpets, growling bellies and gargantuan belches resound. Some of the vibrations are too low to hear, but I feel them as they pass through my body, reverberate in my chest cavity, squeeze my heart. Eye after eye inspects us as eddies of elephants swirl past. An old world laps at the foot of our memories, extinguishes centuries of communal fires. The ropes that tether us loosen. We slip away from the familiar shore and set off towards unimaginable ways of being. We look around with wild hearts. We have become part of the herd. Ah, when was your experience with a sea of elephants? Have a wonderful day! It happened on our first trip to Etosha Pan in 1986, at a waterhole called Kalkheuwel about 20km from Namutoni. Have a wonderful day too ! Been to Etosha and Namutoni, but not sure if I saw that waterhole or not. Thank you for following me and reading my blog. Elephants are indeed magical creatures and I was saddened to read that most of the elephants your great-grandfather cared for were killed in World War II. Good luck with your photography. I hope your holidays were full of cheer, good friends and family. Thanks so much for your kind words; it was a remarkable experience. Thank you Quiall. May your holidays be full of light and love.